Hawthorn is an excellent cardio-tonic helping both physical and emotional ailments of the heart. Hawthorn nourishes the heart by strengthening the pericardial muscle, improves circulation and blood flow, helps normalize blood pressure, strengthens and heals blood vessels and arteries, improves the contractions of the heart, regulates the heartbeat, and overall helps the heart access more nutrition. General heart function is improved by the heart being able to access more oxygen and blood flow. Hawthorn is considered a tonic, meaning it can be taken safely and daily. In Chinese medicine, Hawthorn is used primarily to treat stagnation digestion. In particular it is used to treat digestive blockages caused by greasy foods and meats. As a digestive aid, it is used to treat gas, bloating, and stimulates the appetite. The plant parts of Hawthorn used as medicine are the berry, leaf, and flower. The leaf and flower can be harvested in the spring; the berries are ready from September to late October. The berries are best harvested when they have turned a deep red color and before the first frost. Hawthorn’s affinity for the heart also helps nourish and ease emotional pain and trauma. The flower essence of Hawthorn is spirit settling and holds the heart during times of emotional stress. It opens channels, moving and releasing feelings and allows one to access hope, trust, love, and forgiveness. Hawthorn inspires resilience and strength of heart. The flower essence of Hawthorn is a powerful way of working with the energetic medicine of a plant. The energetic and plant spirit medicine of hawthorn can also be accessed by taking small drop doses of the tincture and working with the raw plant. Healing can also be accessed by sitting with Hawthorn trees. I suggest trying simple meditation and listening to what Hawthorn has to offer. Hawthorn can be made into various preparations. The berries make a delicious herbal syrup and can also be made into jams and jellies. Leaf, flower, and berry can be dried and used as tea and made into tincture. 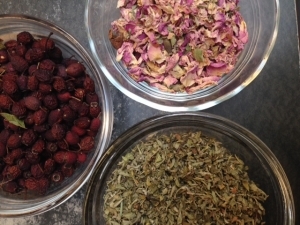 I suggest making a heart healing elixir with hawthorn and other heart centered plants, a recipe for this can be found at the bottom of the page! California Wild Rose: Provides encouragement and promotes strength of heart when moving through difficult times. To help navigate the thorns of life with heart centered empowerment. Green Rose: Holds and nourishes the heart during hardship helping to banish fear with positivity and encouraging connection to ones environment. Borage: Especially helpful when there is heaviness of heart and feelings of heaviness throughout the body. Aids in those times of having a “sinking feeling”. Borage promotes courage by filling the heart with light and buoyancy. Chicory: Encourages inner security and wholeness by addressing feelings of neediness toward others. Chicory counteracts negative attention seeking by re-directing psychic currents of energy to build and nourish ones own heart forces. 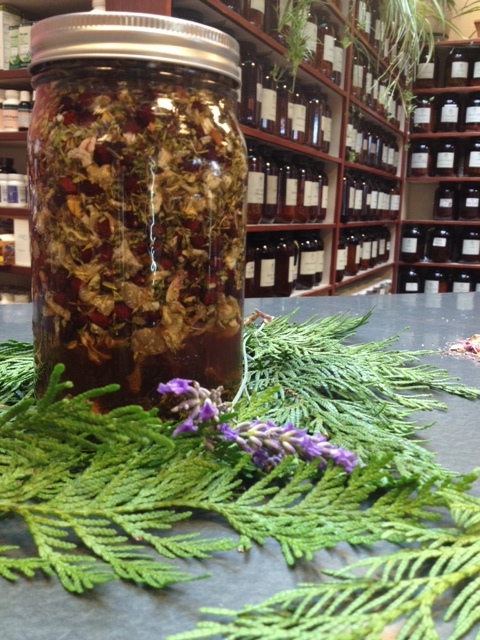 1.Decoct the Hawthorn berries by adding 2 ounces of dried berries to 1 quart of water. Bring to a boil and let simmer over low heat until the liquid is reduced to 1 pint or half as much water as you started with. 2.Strain the herbs from the liquid and pour the liquid back in the pot. 3.Add 1 cup of honey for every 1 pint of liquid while the liquid is still warm but not hot. It’s best to use raw honey and to preserve the live enzymes in the honey by not heating it up. 4.Mix the honey and liquid together well. 5.Pour into bottles. To help preserve you can add a small amount of brandy. Store in the fridge. Syrups will last up to six months in the refrigerator. Elixir is a fancy word for an herbal preparation made of brandy and honey with the purpose of enjoyment. Elixirs can be taken alone, used to dress up desserts, to flavor soda water, or embellish cocktails. This is a great elixir for warming the heart and easing stress. 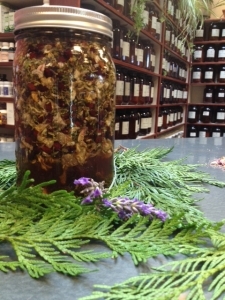 1.Fill a 16 oz glass jar with the herbs. very top, to eliminate oxygen present. 3.Label your jar with the date, ingredients, and moon phase. 4.Place jar in a cool, dry, and dark place for two weeks. Shaking daily and making sure the herbs do not rise above the brandy. If this happens add more brandy. 5.After two weeks, strain the herbs out of your cordial and add Honey. I recommend 4 oz of honey but feel free to use more if you desire a sweeter cordial.